You can read about all of these opportunities in more detail here. Join us at our Spring Social in Paternoster Square right by the beautiful St Paul's Cathedral for some mouth watering bowl food and drinks, totally on us! Bring your pals and colleagues for a fantastic evening with MTYBA at The Saint in Paternoster Square, Thursday 21st February 2019, from 7pm. The outgoing 2018 Committee would like to thank all those who participated in the election, either by standing in the election or exercising their voting rights. There were many excellent nominees contesting the available positions and a very high voter turnout. The incoming 2019 Committee would like to thank the outgoing committee for all their hard work throughout 2018. MTYBA looks forward to another year of working hard to represent the interests of Middle Temple’s young barrister members. Stay tuned for news of upcoming events and opportunities in the New Year. Announcing the Winners of MTYBA's 2018 Advocacy Competition! Many congratulations to Lucile Taylor, winner of MTYBA's 2018 Advocacy Competition, sponsored by LPC Law! Good luck to Lucile on completing her pupillage at Hailsham Chambers! in 4th place: Ariana Caines! Michael Harwood, James Gould & Hayyan Bhabha of MTYBA. 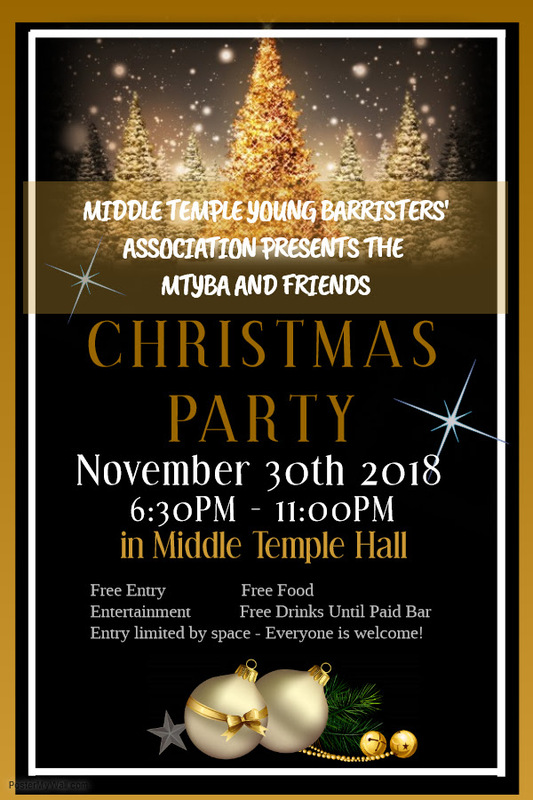 MTYBA will hold the AGM and Election of Officers from 6.30pm on Wednesday 5 December 2018 in Taskers, Middle Temple. mtybareturningofficer2018@gmail.com by 12pm (midday) on Thursday 22 November 2018. Voting: Members will have the option to vote on the night in person, or by email up until midnight on Tuesday 4 December 2018. Please DO NOT send your nominations or votes to this email address – they will not be counted. Term of office: 2019 calendar year. Eligibility: Any member of Middle Temple who has been called to the Bar and is within their first seven years of practice is automatically granted membership of MTYBA. Any member of MTYBA may stand and vote. Candidates may stand for no more than two positions. Hustings for contested positions, voting in person, the count of email votes and an announcement of results will take place at the AGM on Wednesday 5 December 2018. Send your full name, email address, Middle Temple membership number, year of Call, list of positions standing for (no more than 2), and a short biography (max 100 words) by email to the Returning Officer at mtybareturningofficer2018@gmail.com by 12pm (midday) on 22/11/2018. Return a completed ballot by email by midnight on 04/12/2018 or attend the AGM to vote in person. 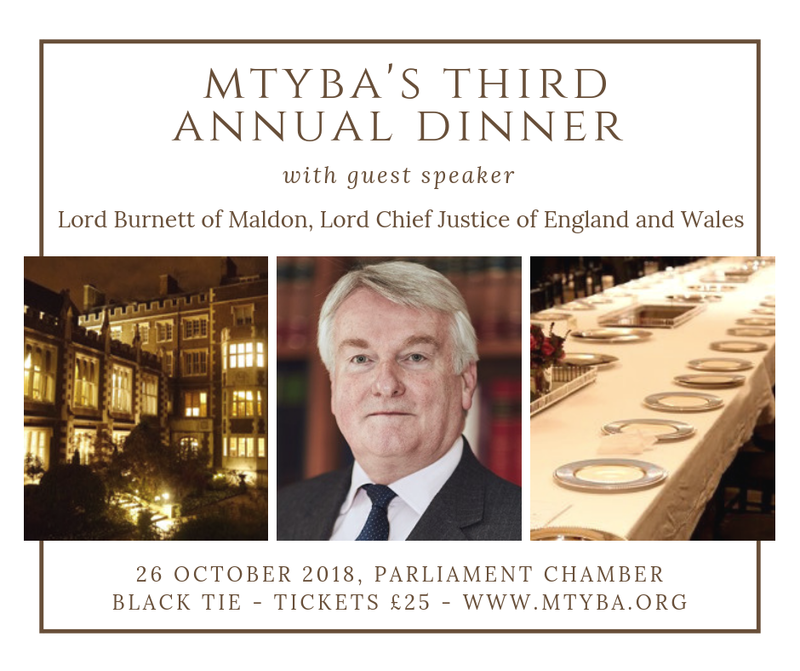 It is with great pleasure we announce that Lord Burnett of Maldon, the Lord Chief Justice of England and Wales, will be the guest speaker at MTYBA's Third Annual Dinner on the evening of Friday 26 October 2018. Join us and your fellow young barristers in Middle Temple's Parliament Chamber for a three-course meal followed by an after-dinner speech from the Lord Chief Justice. The dinner will be preceded by a drinks reception in the Queen's Room from 18:15 and we will be moving into the Parliament Chamber for dinner at 19:00. The dress code is Black Tie. There is likely to be a post-dinner venue booked for further socialising, details TBC. Tickets are available to MTYBA members and their non-MTYBA guests. If you have any dietary requirements, please inform us of them using the relevant buttons when booking your ticket. You will also be given the opportunity to express names of individuals or groups you wish to be seated with at dinner. 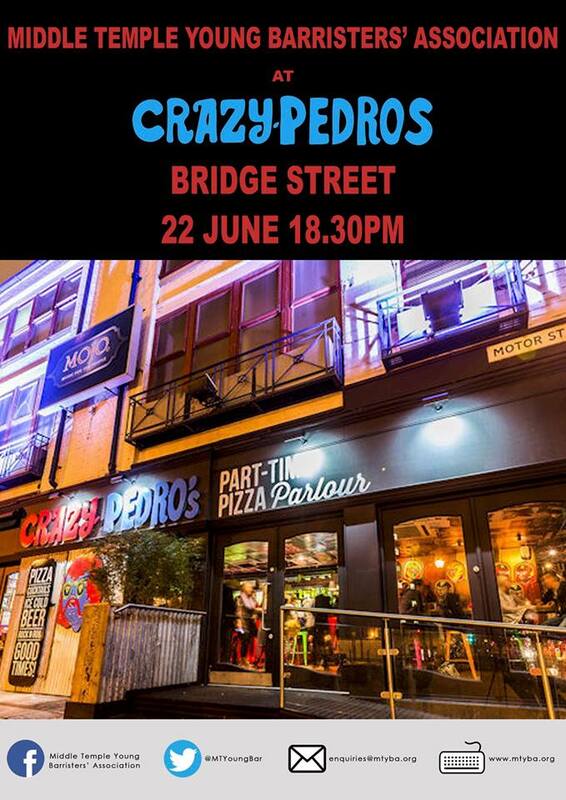 Friday 27th July 2018 at 18:30 our Summer Party will be held on Devonshire Terrace - a lovely open air venue near Liverpool Street station. 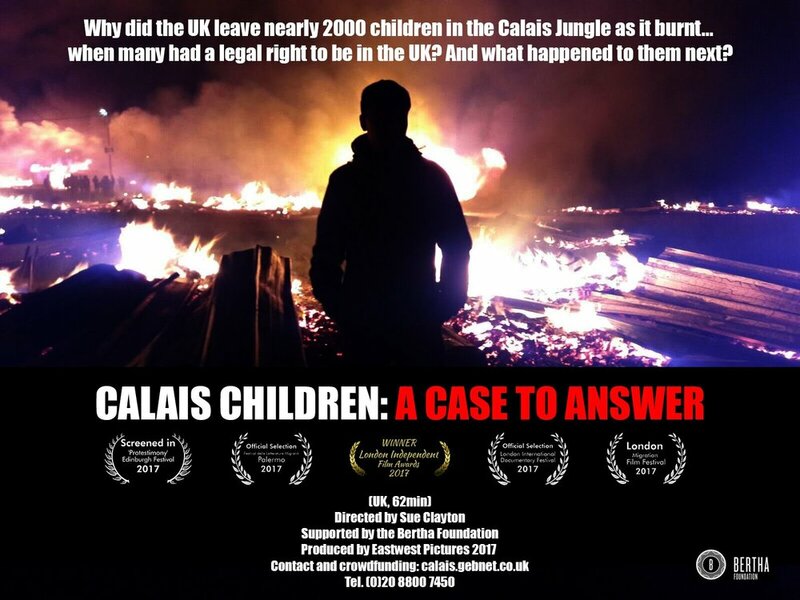 A film made by a Goldsmiths academic highlighting the plight of refugee children has been used as “cornerstone” evidence in a High Court Judicial Review. We have organised a screening of this film on 4th July 2018 from 18:00 in the Sherrard Room. Professor Clayton, who directed the film and gave a witness statement for the Judicial Review will be in attendance and speak after the film has been screened. Her work in the Jungle refugee camp in Calais forms a key part of the challenge which is being brought by the Public Law team at Duncan Lewis Solicitors. It is a must see for any immigration lawyer, JR lawyer or those interested in immigration law. They are bringing a challenge against the Home Secretary for failing to meet the terms of the Dubs Amendment which enshrined in law the relocation of unaccompanied refugee children from other countries to the UK, but which the Government closed in February 2017. On 19 June MTYBA held our annual Jobs and Opportunities fair for BPTC graduates, this year in partnership with the MTSA. There was a fantastic turnout in Hall as members of both associations came to speak to the organisations on show. Thanks to all the attendees and huge thanks to our exhibitors: Free Representation Unit; Government Legal Service; Liberty; Law Absolute; Amicus; No.53 Legal Family Advice Scheme; LPC Law; Bar Pro Bono Unit; Arab Lawyers Association; Stephen James Partnership; Personal Support Unit; AdvocAid; Community Advice Programme; Palms Resourcing; and Axiom. On 1 May 2018, MTYBA will be hosting the first of three events in our Practical Law CPD series for 2018. This first part is all about Mental Health Law, where we'll be joined by Professor Neil Greenberg, a consultant occupational and forensic psychiatrist. Professor Greenberg served in the United Kingdom Armed Forces for more than 23 years and has deployed, as a psychiatrist and researcher, to a number of hostile environments including Afghanistan and Iraq. He also gave evidence in the recent 'Marine A' appeal. Joining him is Aswini Weereratne QC of Doughty Street Chambers, a specialist in mental health and capacity law, and since 2002 a Judge of the First Tier Tribunal (Health, Education and Social Care Chamber). 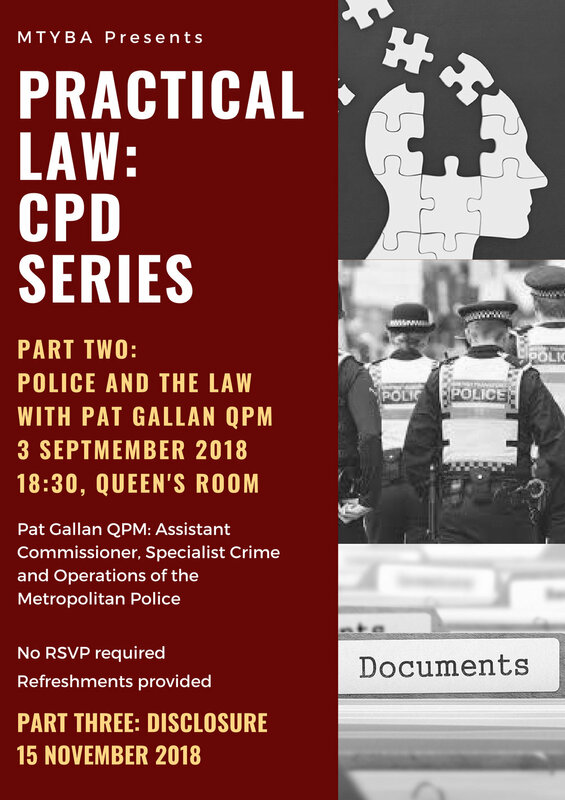 The event promises to provide a fascinating insight into a critically important and cross-cutting area of law. No RSVP necessary. Refreshments provided. Stay tuned for details of parts two and three of the CPD series. Following on from the Application Evening, parts two and three of MTYBA's Pupillage Application Programme take the form of mock pupillage interviews and interview-style advocacy exercises. 1 March and 7 March, both from 18:30, Rutledge Suites, top floor of the Middle Temple Library. Mock interviews 01/03: experienced interview panellists will provide first round-style interviews followed by feedback. Interview Advocacy 07/03: an opportunity to have a go at an unseen interview advocacy exercise in front of a panel of experienced interviewers. Civil and criminal exercises will be available. This event is open to MTYBA members. Please RSVP to enquiries@mtyba.org with your name, year of call and MT Membership number and which of either or both events you wish to attend. You will receive a confirmation email. We will send a further email confirming your time slot and requesting your application form a couple of days in advance of the event. New for this year - MTYBA invites you to watch selected Six Nations rugby matches at Taskers. Free beer, soft drinks and snacks for those who arrive by kick-off. Otherwise BYOB. 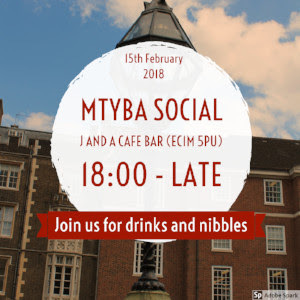 Please join us for the first MTYBA drinks and nibbles of 2018 at the lovely J and A Cafe Bar at 1 Sutton Lane, London EC1M 5PU from 6pm until late (closest station: Barbican / Farringdon). Look forward to seeing you there! No need to confirm your space, just walk in on the night!